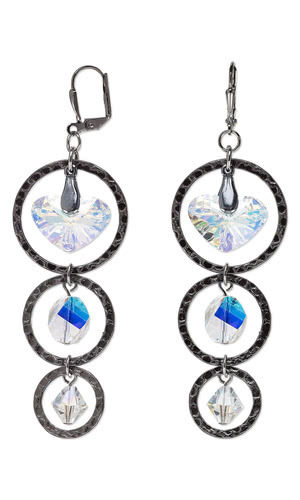 Open the 8x4mm teardrop bail and insert the prongs into the hole on a Swarovski 17mm Crazy 4 U Heart drop. Close the bail, capturing the heart. String one 8mm Swarovski bicone bead onto a 1-inch headpin. Create a simple loop on the straight end of the wire to form a bicone bead drop. Repeat with one 10mm Swarovski helix bead and a 1-inch headpin to form a helix bead drop. Open a 5mm round jumpring and link it to one 25mm hammered round component and the bail on the 17mm crystal heart drop. Close the jumpring. Open a 5mm round jumpring and link it to the bottom of the 25mm hammered round component, the top of a 20mm hammered round component and the loop on the helix bead drop. Close the jumpring. Open a 5mm round jumpring and link it to the bottom of the 20mm hammered round component, the top of a 16mm hammered round component and the loop on the bicone bead drop. Close the jumpring. Open a 5mm jumpring and pass it through the jumpring at the top of the 25mm hammered round component and the loop of the leverback earwire. Close the jumpring. Repeat Steps 1 - 6 for the second earring.